Ideally situated between Lincoln and Nottingham. East Midlands’ best all-weather go-karting with numerous corners, high grip tarmac and twin go engined karts for pure flat-out addiction! Welcome to Elk Motorsport, located in Newark, our go karting is renowned as the best all-weather and outdoor circuit in the East Midlands area. Just seconds from Newark Showground, our track is ideally situated between Lincoln and Nottingham. Don’t be discouraged by the English weather. Our go-karting circuit is an all-weather track with a top quality, high grip tarmac surface. Our Bio Evo2 karts are twin-engined monsters allowing incredible performance and can even reach up to speeds of 60mph. Our go-karts are suitable for most ages starting from 8 years and upwards. 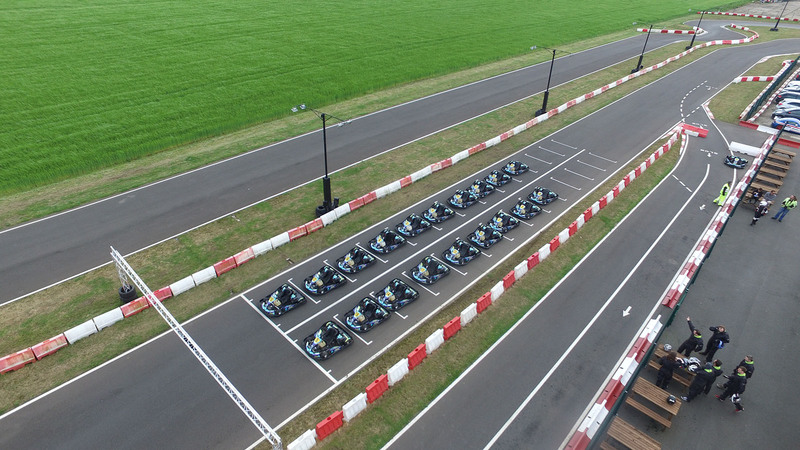 Our outstanding go-karting track is a 1200m circuit; with long straights and fast flowing bends, this track is perfect for a racer of any ability from the beginner all the way up to the professional. The circuit is also floodlit for evening events so we can offer karting outside of our normal opening times to suit the best times for you. Investments in state of the art Apex electronic timing technology gives our groups highly accurate lap times and speed readings with App integration live timing and much more. All go kart equipment, clothing and tuition are provided as part of the price, and our policies on safety ensure an enjoyable experience for everyone involved. Please note that balaclavas are needed if you use our helmets, you can bring your own, or buy them from our circuit at £3.00 each. Want to book go-karting at the best track near Nottingham, Lincoln, Newark and Coddington? Call today on 01636 881531 alternatively email us on info@elkmotorsport.co.uk, and we will get back to you as soon as possible! Raced in a 3-hour endurance event on 12th August 2018 and the whole went ran extremely efficiently and smoothly. There were no issues all day. I have visited this circuit twice before and each time the professionalism and politeness of the staff and marshals have always been nothing other than excellent. If anyone is in the Newark area and fancies a great time, I would seriously recommend ELK Motorsport. Favourite place to go karting. Good friendly staff, clean facilities, great kart and excellent track! This place also seems to keep reinvesting as it’s better every time we go. Fantastic track and venue twin engine go karts and the Grand Prix package is amazing will be back.